Advanced nutritional technology for maintaining digestive equilibrium. Package: 1.4 kg, 3 kg, 6 kg and 15kg. A 1.4 kg tub fed at 68g per day will last 19 days. Instructions: 1 to 1 1/2 measures (68 to 102 g per day) depending on the size of the horse. Mix well into damp feed. Storage: Store in a dry place and replace lid tightly after use. Contents: Protein 0% Ash 89.47% Fibre 0.06% Oil 0.06% Moisture 5.8%. Ingredients: Sodium Hydrogen Montmorillonite, Calcium Carbonate, Silicon Oxide, Calcium Oxide, Magnesium Oxide, Aluminium oxide, Sodium Chloride, Zinc Sulphate, Copper Oxide, Cobalt Carbonate, Sodium Borate, Iodine, Phosphorous P.
It has been demonstrated that the resulting acids and harmful toxins, when absorbed into the system, are the cause of certain negative physical and psychological effects. 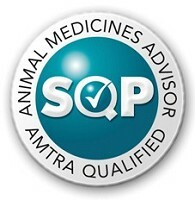 Various research trials over the years have indicated that many equine behavioural problems are directly associated to digestive disturbances. Modern high cereal content diets can provoke bacterial imbalance in the digestive tract. When this happens, some of the beneficial bacteria are suppressed and some of the potentially harmful bacteria are allowed to proliferate. It has been demonstrated that the resulting acids and harmful toxins, when absorbed into the system, are the cause of certain negative physical and psychological effects. Symptoms of such effects include, filled legs, diarrhoea, rapid feeding, inability to settle or relax in the box, depraved appetite, passage of exaggerated amounts of whole grain in the droppings etc. 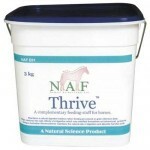 NAF Thrive an entirely natural, montmorillonite clay, has a well deserved reputation amongst many owners and trainers as the effective aid to maintaining correct intestinal equilibrium. 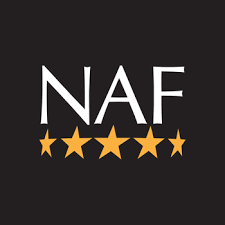 NAF Thrive swells when wet, and by bulking up the intestinal contents, slows down the passage of food in the intestine allowing more time for thorough digestion. In addition the ultra-fine montmorillonite is able to absorb excess lactic and propionic acids, whilst providing such essential amino acids as L Lysine and DL Methionine.